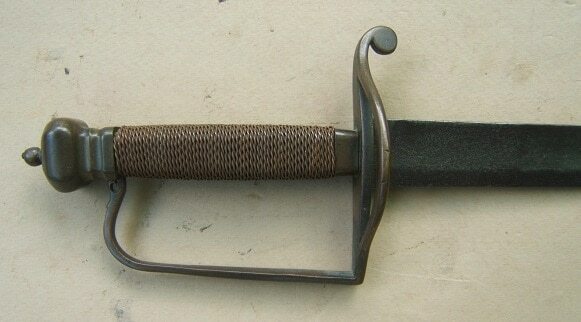 A VERY GOOD GERMAN (PRUSSIAN) HESSIAN-TYPE REVOLUTIONARY WAR PERIOD MILITARY SMALLSWORD/RAPIER, ca. 1760: In overall very good+ condition with generally smooth surfaces and a deeply toned age-patina. 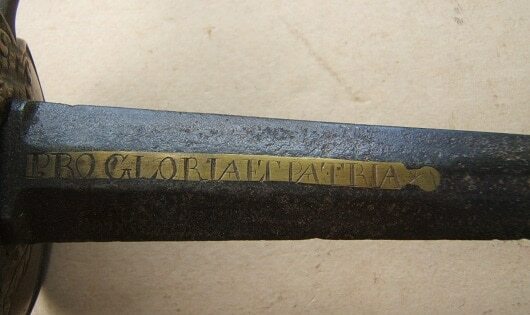 The double-edge, 32 1/2″ blade with a flared ricasso and set on each side with brass inserts, inscribed with “PRO GLORIA ET PATRIA*” inscription, as is often seen on such Prussian Military swords of the mid-18th Century. Very good untouched blade with dark, brown-gray, steel surfaces and some scattered pitting and minor abrasions. 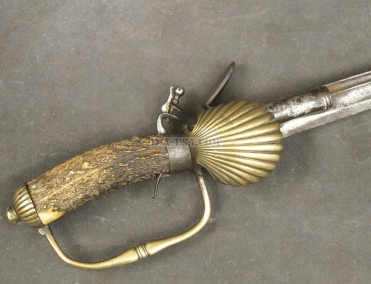 Cast and embossed, heavy gauge, brass hilt of typical German Military Smallsword/Rapier form (made without decorative/delicate pas d’anes) with a floral embossed, faceted, ball-shaped pommel and a fine tang-peen. The hilt and double shell-type guard with matching embossed borders; and the knuckle guard and quillon chased and embossed, en suite with rococo style acanthus leaves. Retains its oxidized and worn leather grip-wrap (shrinkage & slightly torn stitching) and its matching hardwood grip-core: missing its braided wire wrap. In overall very good, tight condition. The blade with generally smooth untouched surfaces, patches of scattered light pitting and signs of use and wear. Fine tip and very good cutting edges: the ricasso with clearly engraved brass panels. The hilt with smooth dark, mustard-toned, brass surfaces with sharp detail to the embossed decorations. A very fine, Military Type German/Prussian Smallsword/Rapier, ca. 1760. Overall length, 40″. For a very similar example, please see, G. C. Neumann’s: “Battle Weapons…”, pg. 343.